23rd July was one of the hottest days of the year so far, coming in the midst of the sunniest summer for decades. It was sweltering, but such a sun-soaked evening seemed like a totally fitting day to celebrate the completion of SE24’s latest installations which consist of large solar PV arrays at St Christopher’s Hospice, and at Dulwich College. These are now generating at full capacity delivering cheaper and greener electricity. SE24 already had installations on Herne Hill United Church and Herne Hill Methodist Church Hall, but St Christopher’s and Dulwich College are by far our largest projects to date. These latest installations have massively increased our generating capacity. We now have over 200KW generating capacity (that’s over 800 panels). 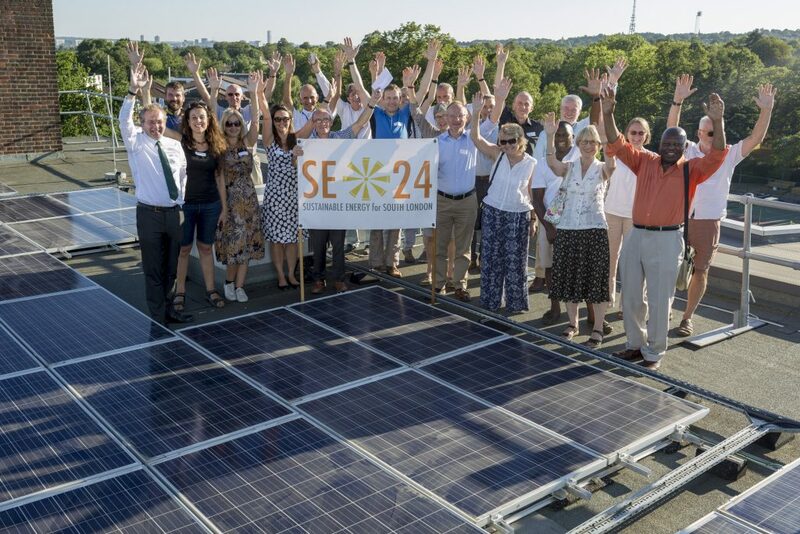 SE24 is now one of the largest of the 200 community energy groups around the country. For SE24 this marks the high point of 4 years of dedicated hard work and St Christopher’s hosted a celebration to remember. Councillor Richard Livingstone, (Southwark Council, Cabinet member for Environment, Transport Management and Air Quality) put SE24’s achievements into a local and national policy context and explained how SE24’s work supports the many ways in which Southwark Council themselves are trying to green their energy policy. Alan Jones, (Chair of SE24) spoke about what lies ahead for SE24. Three Phase 3 installations are being investigated for 2019 completion. Mark Hughes, (Treasurer of SE24) and Ian Penistone, (Head of Facilities and Estates, St Christopher’s Hospice) took everyone up on to the roofs at St Christopher to inspect the installations.